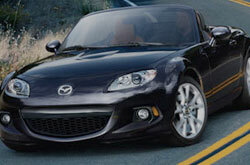 To begin reading Joe Myers Mazda's 2013 MX-5 Miata review, scroll down below the video. We are a premier Mazda dealership in Houston, and it's our job to equip you with Mazda reviews recorded by some of the most striking automotive writers in the industry. Every article comes crammed with practical information, specs and research - just what you need to make sensible decisions on your next Mazda MX-5 Miata purchase. What are you waiting for? Watch the video below or start reading the 2013 MX-5 Miata review below! By examining the 2013 Mazda MX-5 Miata next to the 2013 Ford Mustang, Mini Cooper and the Fiat 500, and you can see that the MX-5 Miata wins over those autos in several zones. Check out the hightlights below. Like the MX-5 Miata? Get a quote on your trade-in and save! Unlike mom and pop auto centers, our Houston car repair facility offers trustworthy OEM parts, phenomenal Mazda trained technicians and a 12-month long warranty for all services. We're also conveniently planted near numerous neighboring cities. Joe Myers Mazda's auto service veterans will help keep your Mazda MX-5 Miata in muscular working order. We handle a slew of jobs with ease, including Mazda wiper blade replacement, tire rotation and maintenances and, of course, tough tasks like transmission repair - and this is just a small part of what we can take on. It's clear - to get honest prices and masters Mazda repairs, Joe Myers Mazda should be your number one choice when selecting a Houston auto center. The upcoming link is your roadway to ridiculous savings. Click now to be taken to to Joe Myers Mazda's specials.